I walked in the church, scanned the pews for a place to sit, and found tears in my eyes. You know that story in the Bible where God opens the servant’s eyes to see the army of horses and flaming chariots surrounding him? His eyes were opened to see what had been all around him all the time—and suddenly he didn’t feel so alone anymore (2 Kings 6:14-17). Well, God opened my eyes last weekend. For several months I’d been ruminating on how alone I felt. And it seems I never miss an opportunity to tell my readers that I’m 1,000 miles from home. Indeed, writing to my roots has revealed that I often feel displaced in my new home, and I feel even more that way when visiting my old home. Being in a hiatus from work and school has also laid some things bare: I don’t know who I am without my work. Sometimes I don’t know how to relate to people outside of the most functional of activities: I can be a teacher, a sister-in-law, a communications secretary and music leader for church, a Bible study leader for friends. But what about just a friend? I can tell you right now, friendship—hanging out, relaxing, shooting the breeze—none of these have been my strengths. Yet despite all the off-putting, prickly parts of me, God has drawn friends to me. And at the church that day, I saw them. There was Tasha sitting in the back left pew of the church. Her friendship was a carryover from the small group Bible study my hubby and I had for a year and a half. We still get together often, for fun things like spa days, iced tea, and girl talk. 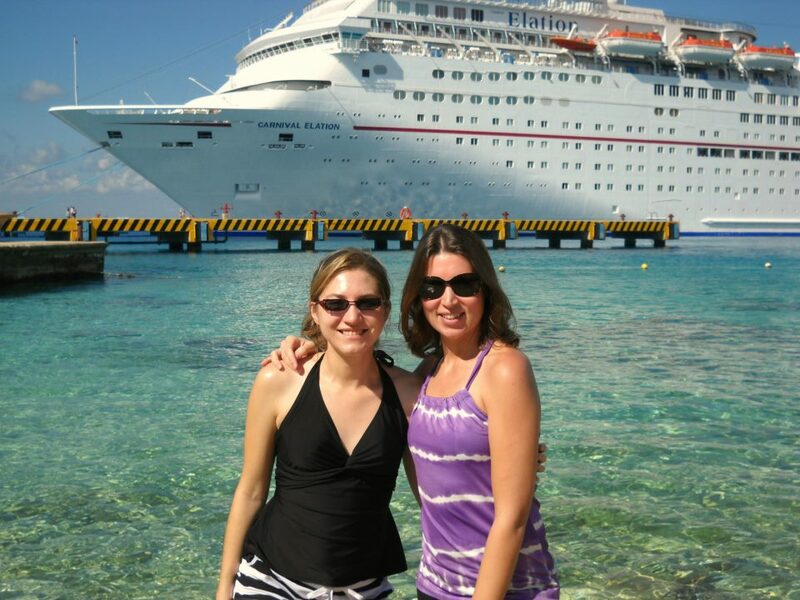 Me and Tasha–on our cruise to Cozumel in December. The hubbies came, too. Then, a few rows up, was Tammy, a new-ish fixture in our church, who responded to the call I made in October to start a choir. Now she has taken the reins, much relieving me, and also become a fun girlfriend. My friend Tammy directing a mean choir in December! They sounded great. I’m at the piano to the left (you can’t see me). Across the aisle were Ashley and Christina, two young moms whom I’d only recently come to know from our Tuesday night prayer group. They’d been in the congregation for many months before their lovely personalities were uncovered for me. Both sincere and searching for the Lord, they responded to the opportunity to pray with Amanda and me, who had recently been trained in prayer ministry. Me and Ashley at my house for a late night Easter egg hunt. It was for the kids…really! 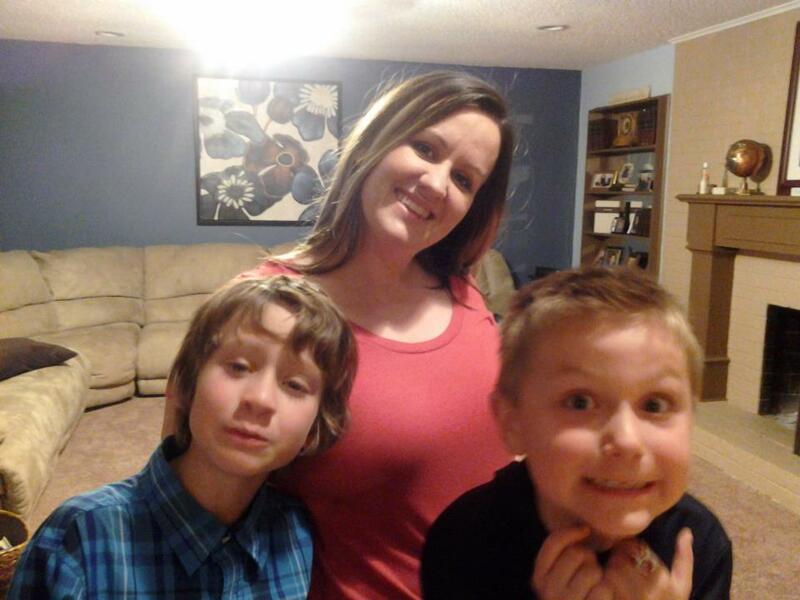 Christina with her two strapping boys–also at my house for that late night Easter egg hunt. And behind them was Amanda. I had known Amanda the longest of any of these ladies, yet until our prayer training, I’d hardly known her all–had not seen the beauty of her personality beneath her quiet exterior. Now we are prayer partners and buddies in ministry. 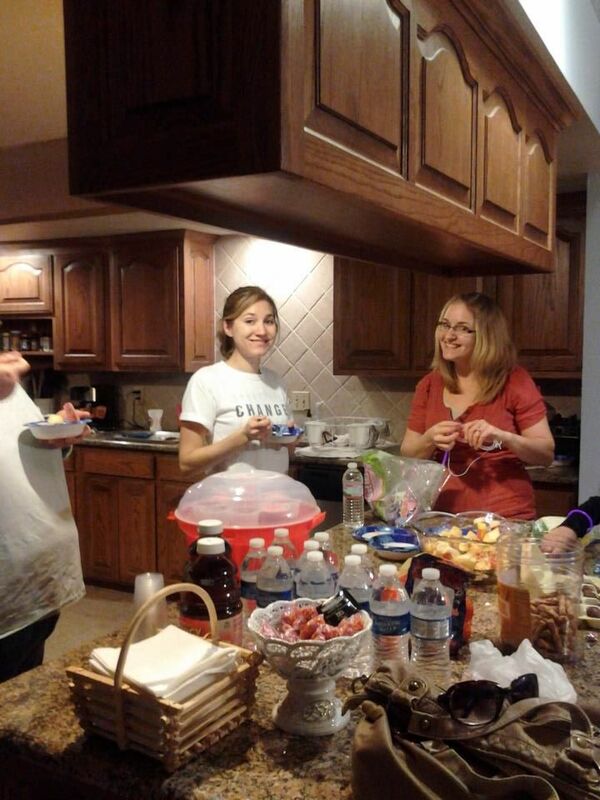 That’s Amanda chuckling on the left–we had a great time at our 2012 New Year’s party. 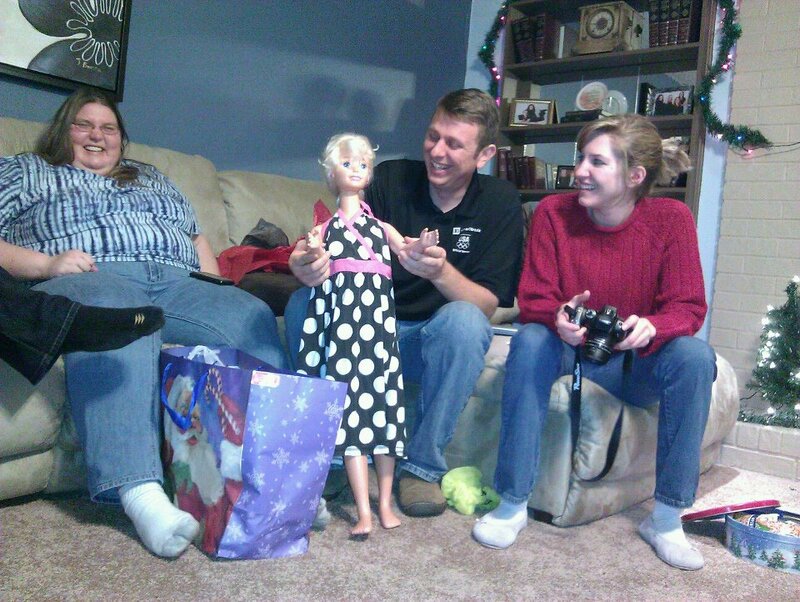 The life-sized Barbie was my husband’s surprise in our informal gift exchange. How did it come to be that I was so blessed with all these friends? Last summer when Amanda and I joined the prayer ministry Straight 2 the Heart to lay our hearts bare before God and our small group—I saw that we had a lot in common. A lot of hurt, a lot of self-protections, and a lot of desire to serve the Lord if we could only know how to channel our pain into something positive. Looking back, I think it must have been the laying bare of my heart before God and a trusted small group that allowed me to be more authentic with these others that have decided they like my company. Sure, I’m still detail-oriented and serious when I talk church business. But over the past year, I’ve had more frank and open conversations with ladies in my church than I’ve had in eight years combined. Sharing my heart in a prayerful, supportive environment has bound me together with Amanda, and now Ashley and Christina, in a way that mere biblical instruction can’t. 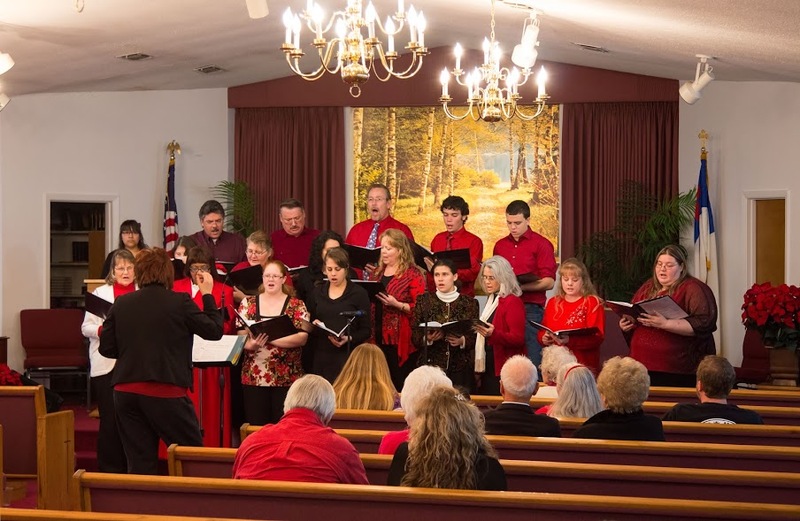 And as a result, I have been able to relate more authentically to others like Tammy and Tasha, and even my music committee in meetings, where we have finally started talking openly and corporately about issues our church has had for a number of years. Showing some vulnerability not only to my prayer partners but also to my acquaintances has opened the door for conversation that goes beyond surface level…and finally, friendship. Since deciding to be more honest with others, it’s been a relief not to have to hide my feelings—to be able to speak up when something’s on my heart—to get it out in the open and deal with it sooner rather than later. And saying things that have gone unspoken before—such as on music committee—has actually gotten people thanking me for my honesty and openness. Do people prefer pretenses, or plainness? While being honest can open up some uncomfortable cans of worms, in my experience, that’s not any worse than tiptoeing through church—and through life—not knowing and not being known by anyone. Being honest is no worse than feeling alone—wondering if I’m the only one who ever suffers. As I’ve learned, the sooner we share our stories with someone and listen to theirs in return, the sooner we are brought out of our self-centered misery. The sooner our eyes are opened to the fact that we are not alone. I’m so thankful for my friends in high places, the old no less than the new (although this post just happened to be inspired by the new). Much love to all! Here’s to many more great memories! Love this thank you so very much Lindsey! Beautifully written! Because I had a great subject to write about! Thanks for your friendship! Thank you for writing those kind words! I am so happy to have a new friend in you, and I look forward to growing our friendship. My pleasure, and me too, Tammy! What a beautiful post with beautiful people. I can’t get over that Barbie, though hahaha. Yes, it gave us quite the chuckle! Best gift I’ve ever seen at a Christmas gift exchange! I’ve never seen one–at least not that I remember. And I’m pretty sure I would remember that haha! You said, “As I’ve learned, the sooner we share our stories with someone and listen to theirs in return, the sooner we are brought out of our self-centered misery. The sooner our eyes are opened to the fact that we are not alone.” That is what attracted me to your blog. You write about real issues, things that touch the human condition. I very often feel alone, even though I have “friends” and colleagues the world over from my work. But I have a disability. I am a paraplegic/wheelchair user from a traffic accident when I was 29 years old. Having a disability can make you very much alone, as people do not know how to deal with you. I do everything everyone else does, pretty much, but I am different. That sometimes makes me alone. But I have learned to deal with it. Alone, but not lonely. Wow, I had no idea, Les, but I am glad you shared with me. I have read a little bit about how people with disabilities often get overlooked because people don’t know how to relate to them, and are afraid of offending them–or you–I guess. I might qualify in the same boat there, not doing a great job at reaching out to those who have an issue I don’t…but actually, I think this goes for people with visible as well as invisible differences or pain, so I guess that is the connection? Am I correct in thinking you’d prefer people to just be honest and ask you open questions about being paraplegic, rather than pretending it’s not there? That’s how I feel about some of my emotional stuff.